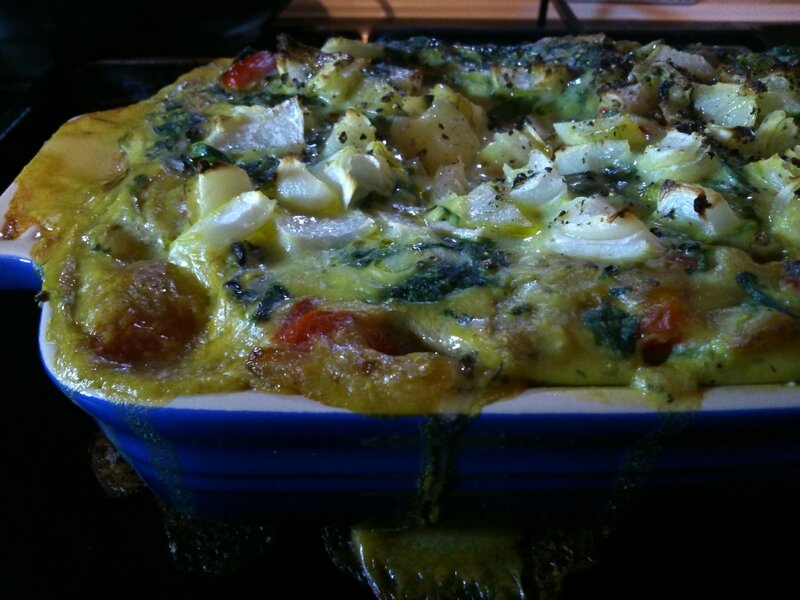 I ferreted around in the cupboards, fridge and freezer, and came up with this recipe. It’s comforting and moreish, and as well as being super easy, it’s pretty quick to put together! Heat 1 tbsp of the oil on a medium heat in a saucepan or frying pan and cook 3/4 of the onion and the red pepper for a few minutes until the onion is a little brown. Add the mushrooms and garlic powder and continue to cook, stirring, for a couple of minutes until the mushrooms are softening. Cook the spinach in the microwave, on full power and partially covered, for 1 minute to defrost. Add the soy milk, and heat for a further 2 minutes. The spinach mixture should be just under boiling temperature, it needs to be very hot for the potato starch to work. Add the mustard powder and nutritional yeast and mix thoroughly, along with a little salt and pepper. Next add the potato starch, stirring as you do so. The sauce should thicken after a few seconds. It needs to be pretty thick for assembling the lasagne, it will loosen a little as it bakes and help to soften the pasta sheets. Now assemble the lasagne, I used a 18 x 12 cm stoneware dish, which only just fitted everything in! Put a thin layer of spinach sauce in the bottom of the dish, then add half the tomatoes, seasoning with half of the oregano and some black pepper. Then add a sheet of lasagne, and then half of the mushrooms on top of this. Next is half the remaining spinach sauce. 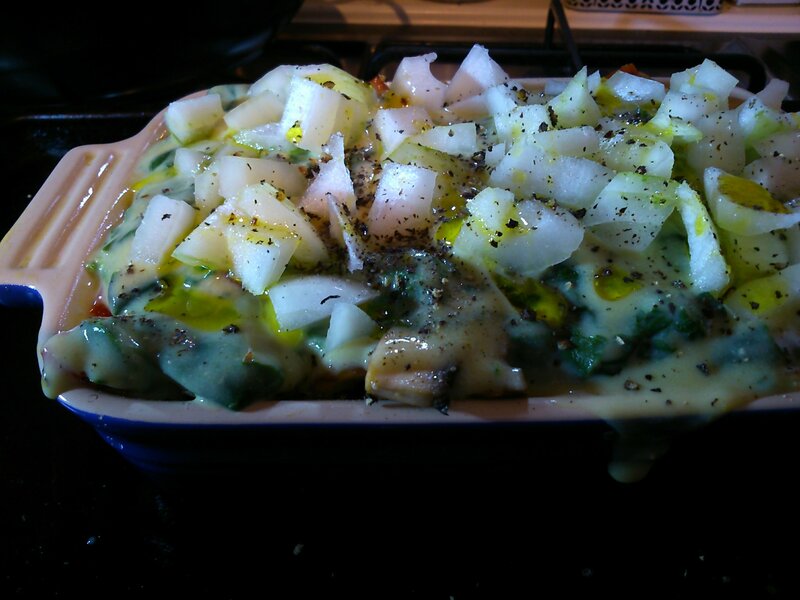 Then tomatoes, lasagne, mushrooms, and lastly spinach sauce. Top with the remaining onions, and drizzle with a little oil and some black pepper. Bake for 30 – 40 minutes until the top is starting to brown and the pasta is soft.